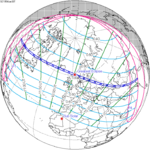 A total solar eclipse occurred on Friday, August 1, 2008. A solar eclipse occurs when the Moon passes between Earth and the Sun, thereby totally or partly obscuring the image of the Sun for a viewer on Earth. A total solar eclipse occurs when the Moon's apparent diameter is larger than the Sun's, blocking all direct sunlight, turning day into darkness. Totality occurs in a narrow path across Earth's surface, with the partial solar eclipse visible over a surrounding region thousands of kilometres wide. It had a magnitude of 1.0394 that was visible from a narrow corridor through northern Canada (Nunavut), Greenland, central Russia, eastern Kazakhstan, western Mongolia and China. Occurring north of the arctic circle, it belonged to the so-called midnight sun eclipses. The largest city in the path of the eclipse was Novosibirsk in Russia. 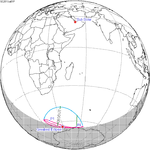 The total eclipse lasted for 2 minutes, and covered 0.4% of the Earth's surface in a 10,200 km long path. 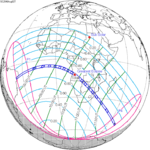 It was the 47th eclipse of the 126th Saros cycle, which began with a partial eclipse on March 10, 1179 and will conclude with a partial eclipse on May 3, 2459. 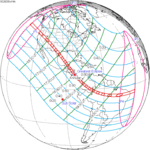 A partial eclipse could be seen from the much broader path of the Moon's penumbra, including northeastern North America and most of Europe and Asia. It was described by observers as "special for its colours around the horizon. There were wonderful oranges and reds all around, the clouds lit up, some dark in silhouette, some golden, glowing yellowy-orange in the distance. You could see the shadow approaching against the clouds and then rushing away as it left." The eclipse began in the far north of Canada in Nunavut at 09:21 UT, the zone of totality being 206 km wide, and lasting for 1 minute 30 seconds. 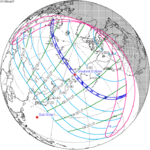 The path of the eclipse then headed north-east, crossing over northern Greenland and reaching the northernmost latitude of 83° 47′ at 09:38 UT before dipping down into Russia. 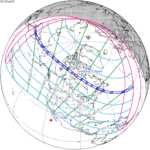 The path of totality touched the northeast corner of Kvitøya, an uninhabited Norwegian island in the Svalbard archipelago, at 09:47 UT. 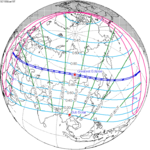 The eclipse reached the Russian mainland at 10:10 UT, with a path 232 km wide and a duration of 2 minutes 26 seconds. 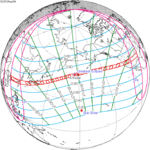 The greatest eclipse occurred shortly after, at 10:21:07 UT at coordinates 65°39′N 72°18′E﻿ / ﻿65.650°N 72.300°E﻿ / 65.650; 72.300 (close to Nadym), when the path was 237 km wide, and the duration was 2 minutes 27 seconds. 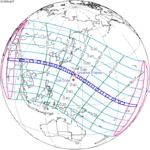 Cities in the path of the total eclipse included Megion, Nizhnevartovsk, Strezhevoy, Novosibirsk and Barnaul. Around 10,000 tourists were present in Novosibirsk, the largest city to experience the eclipse. The eclipse over Russia, Norway, and the Arctic Ocean as seen from NASA's Terra satellite. The progression of a solar eclipse in Novosibirsk. All times UTC (local time was UTC+7). 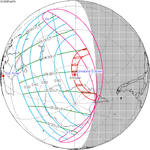 The path of the eclipse then moved south-east, crossing into Mongolia and just clipping Kazakhstan at around 10:58 UT. The path here was 252 km wide, but the duration was decreased to 2 minutes 10 seconds. The path then ran down the China-Mongolia border, ending in China at 11:18 UT, with an eclipse lasting 1 minute 27 seconds at sunset. The total eclipse finished at 11:21 UT. The total eclipse passed over Yiwu County, Jiuquan and Xi’an. Around 10,000 people were gathered to watch the eclipse in Yiwu. A partial eclipse was seen from the much broader path of the Moon's penumbra, including the north east coast of North America and most of Europe and Asia. In London, England, the partial eclipse began at 09:33 BST, with a maximum eclipse of 12% at 10:18 BST, before concluding at 11:05 BST. At Edinburgh the partial eclipse was 23.5% of the sun, whilst it was 36% in Lerwick in the Shetland Isles. German charter airline LTU, now trading as Air Berlin, operated a special flight from Düsseldorf to the North Pole to observe the eclipse. Flight number LT 1111 spent over 11 hours in the air, returning to base at 6pm after flying a planeload of eclipse chasers, scientists, journalists and TV crews to watch the celestial event. The route also included a low-level sightseeing tour of Svalbard before the eclipse and the magnetic pole afterwards. ^ Espenak, Fred; Jay Anderson (July 2004). 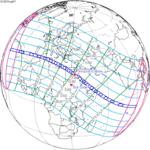 "Total Solar Eclipse of 2008 August 01 - Parameters". NASA. Archived from the original on 2007-03-21. Retrieved 2008-08-09. ^ a b c "Total Solar Eclipse of 2008 August 01". NASA. July 23, 2017. Archived from the original on March 9, 2008. Retrieved 2008-08-09. 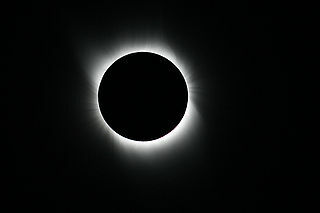 ^ a b c "Total eclipse a dark show for thousands". Herald Sun. August 3, 2008. Retrieved 2008-08-09. ^ a b c d e Espenak, Fred; Jay Anderson (March 2007). 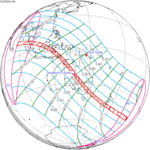 Total Eclipse of 2008 August 01 - NASA Technical Bulletin 2007–214149. Retrieved 2008-08-09. ^ Royal Astronomical Society (July 31, 2008). "Solar Eclipse On The Morning Of August 1st". ScienceDaily. Retrieved 2008-08-09. 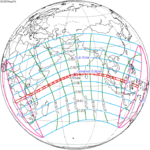 Wikimedia Commons has media related to Solar eclipse of 2008 August 1.